Groundhog Day is a holiday celebrated on February 2 in USA and Canada. According to folklore, if it is cloudy when a groundhog emerges from its burrow on this day, it will leave the burrow, signifying that winter-like weather will soon end. If it is sunny, the groundhog will supposedly see its shadow and retreat back into its burrow, and the winter weather will continue for six more weeks. Do you want to meet Phil? Let me introduce you to him! Groundhog.org has given us the idea of drawing our personal groundhog using our fingerprints like this. Lizzy and I are doing this with 1ESO. The first official trek to Gobbler’s knob was made on February 2, 1887. Each February 2nd since, thousands of people celebrate Groundhog Day by making the trip to Gobbler’s Knob to get the official word of the world’s only true weather forecaster. 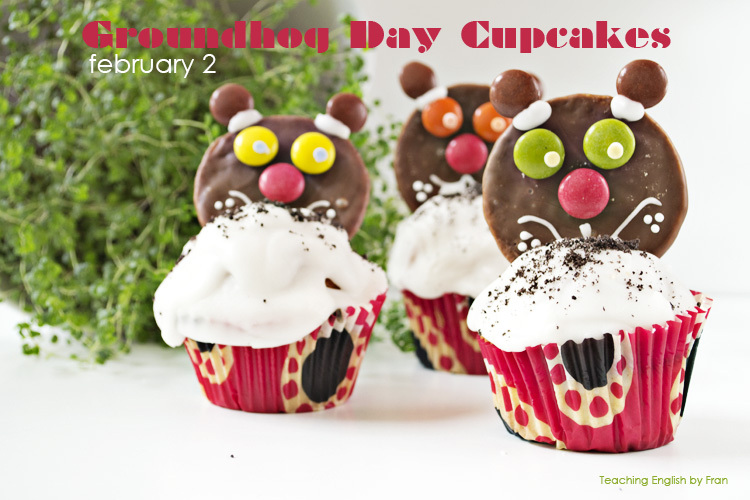 The rest of the day is filled with activities including: the annual Groundhog Banquet, crowning of the Groundhog King and Queen, school assemblies, craft shows, and activities for entire families. 1. Use a dictionary to look up the meaning of the underlined words in the paragraph. Write a sentence to show the meaning of each word. 5. Name two things that happen in Punxsutawney on Groundhog Day. Enjoy Groundhog Day and cross your fingers for an early spring! Last year Phil predicted six more weeks of winter... the show is almost to start! Groundhog Day Fun Facts infographic by accuweather.